Few people watercool workstation cards but in case you're interested in doing this you'll be glad to hear that EK Waterblocks has just announced the very first waterblock for NVIDIA's Quadro K5000. It will start shipping on March 4th for 109.95EUR. EK Water Blocks, Ljubljana based premium water cooling gear manufacturer, is proud to introduce the EK-FCQK5000, world's first water cooling solution for NVIDIA Quadro K5000 professional graphics card, the key part of NVIDIA Maximus Technology. 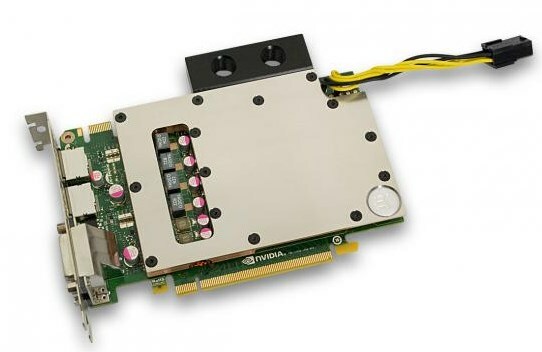 EK-FCQK5000 is a high performance full-cover water block for nVidia Quadro K5000 series professional graphics cards. This water block directly cools the GPU, RAM as well as VRM (voltage regulation module) as water flows directly over these critical areas thus allowing the graphics card and it's VRM to remain 100% stable under any given workload. EK-FCQK5000 water block also features a high flow design therefore it can be easily used in liquid cooling systems using weaker water pumps.